The faculty at MC pride themselves on their alumni. We know they are well trained and flexible, ready for a number of different post-graduation paths. A recent research study on peanut allergies that has gotten a lot of press has reaffirmed this pride. Researchers in the LEAP (Learning Early About Peanut Allergy) Project have discovered that the conventional wisdom about peanut allergies may have been wrong. The original article can be found in the New England Journal of Medicine and the results have been reported in major media outlets like CNN and the New York Times. One of our own, alumna Kaitie (Fernandez) Lawson, MC class of 2009 was involved in this work. 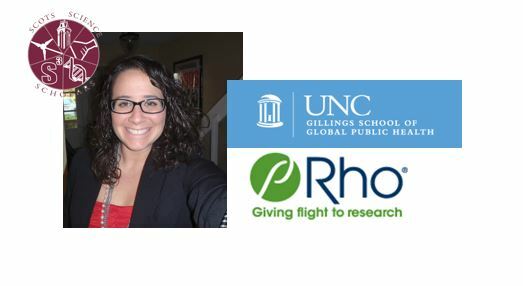 Kaitie works at Rho, a contract research organization, as a biostatistician helping medical research teams design experiments and make sense of the results. Her involvement with LEAP is described in the Appendix to the NEJM paper, which you can see here. She says she uses her liberal arts skills every day when she has to communicate difficult concepts either in writing or in presentations. Her training also allows her to see things from multiple perspectives and to deal with a variety of people and situations. Kaitie completed a math major at MC while she played on the soccer team and sang in the concert choir and Off Kilter. After graduating, she was accepted into a highly competitive Master’s program in Biostatistics at the University of North Carolina, Chapel Hill . She was hired at Rho after getting her Master’s degree. Kaitie is another example of where a math major from a liberal arts college can take you. We look forward to having Kaitie as a guest speaker in the S3 program in the near future.